ProZ.com report to members, 2018 « Translator T.O. Next year marks 20 years of ProZ.com helping language professionals to expand their businesses and improve their work, while networking and also having fun. Here’s a glimpse/reminder of what ProZ.com looked like back in the beginning. Since then, ProZ.com paying members have been using an ever-growing suite of services and benefits the site provides to take their careers to the next level. They are also the reason the site has been able to offer those tools and opportunities, and the reason the site is available to everyone. So if you are a paying member of ProZ.com and are reading this, thank you! The ProZ.com site team is here to serve you. Significant effort is being made to improve the experience and results for those who use ProZ.com to seek the services of freelance language professionals (thereby improving results for freelancers as well). This includes, but is not limited to, improvements to matching clients and service providers, and improving the marketing tools and benefits available to members. Business membership (formerly Corporate) has been updated as part of a restructuring that started last year, and consists of three benefit tiers: Standard, Plus, and a new tier, Enterprise. World map of Business member translation companies: You can peruse 500+ translation companies and agencies who are Business members at ProZ.com on the new Business member map. The maps shows information about each company, including location, contact info, and average LWA rating. Business pages are being released. Business pages are separate from profiles and Blue Board records, and are designed to provide a centralized record of factual, up to date information regarding a given company, including the individual profiles on ProZ.com operating on behalf of that company. 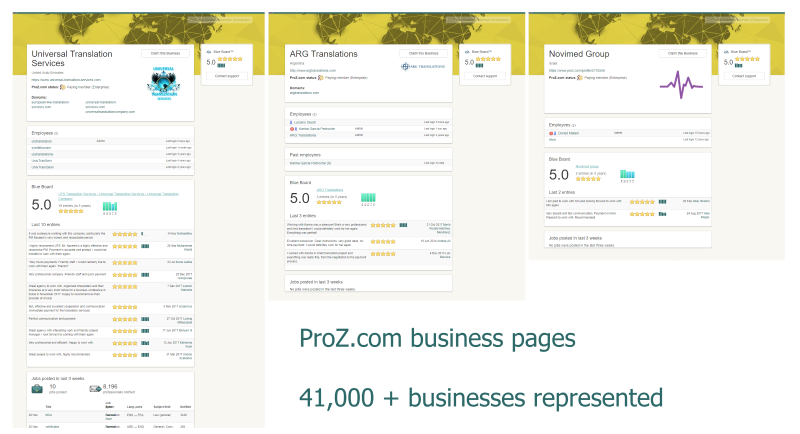 A new directory, ProZ Find™, was released, with improved search features and additional enhancements for Business members. The invoicing tool is now easier to use on mobile devices, with a modernized look and feel. All world currencies are now supported, and exchange rates are updated automatically. Clients can now pay invoices online using ProZ Pay™ or PayPal. Financial reports contain more information, and key reports can be exported to spreadsheets for offline use. Many reported bugs were fixed. Video greetings were added for profiles. You can use this video to speak to and show potential clients more about your services. Like/Agree tools for forums and the “What I am working on” were added to better facilitate networking. You can now log in to ProZ.com using your LinkedIn, Facebook, or Google account. Powwows and real-time chat were added. There is a new, customizable home screen with live activity feed. You can now be immediately notified via ProZ.com Mobile of new jobs and job quote reactions, new KudoZ questions and answers, forum contributions, “What I am working on” posts and comments, and more. There is a new notification center containing a history of your notifications, with the option of prioritizing the notifications you care about the most. It is now possible to call members of ProZ.com Pools™ via phone and Skype– includes phone interpreting service by members of the interpreters pool. You can now update your basic profile information from within the app. New service integration: contests (more on contests below). The ProZ.com site team are constantly in touch with members online, but sometimes they get to meet up in real life too. Staff attended BP18 and GALA 2018 this year. Behind the scenes, many smaller changes have been made to further improve site security, including a formalized bug bounty disclosure program. Improvements to both hardware and software were made throughout the year, to continue to ensure quick, uninterrupted delivery of the site to its members. Rita Pang, Davide Fezzardi, Claudia Pesce, Thorsten Schülke, Stephanie Schimkowitsch, Anita Planchon, dkfmmuc, Christine Andersen, Sabine Winter, Kay-Viktor Stegemann, Alessandra Vita, Noura Tawil, all members of the Certified PRO Network who have acted as a sounding board for many of the new features and improvements released, site localization teams, ProZ.com site moderators, the members who are volunteering as ProZ.com mentors, and ProZ.com trainers. 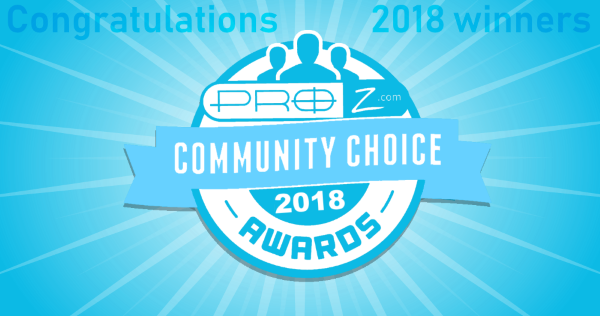 On behalf of the entire ProZ.com site team, thank you to all ProZ.com members for investing in your business and for supporting ProZ.com through your membership. If you are a translator or you work with translators, the ProZ.commission statementexplains how the site works for you: By providing tools and opportunities for you to network, expand your business, improve your work, and have more fun. If you have questions about membership, or need answers or help regarding anything else at ProZ.com, do not hesitate to contact staff through theonline support system.